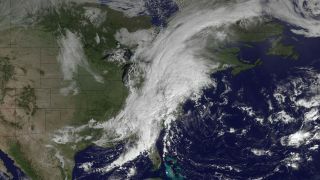 The GOES satellite captured this image of a large system of rain and thunderstorms over the East Coast on Sept. 18, 2012, that is unusual for this time of year, and is likely to produce much rain and strong winds. Parts of the East Coast have experienced strong storms today and other parts of it are in for more extreme weather tonight (Sept. 18) — the GOES satellite caught a snapshot of the system bringing the winds and rain. The weather system is unusual for this time of year, National Weather Service meteorologist John Koch told OurAmazingPlanet. The system is dangerous in a number of ways. For one, it's likely to drop a lot of rain over a large area, stretching from the Carolinas up into New England, and extending west into the Appalachians. Areas of Tennessee and Kentucky in the Appalachians have received the heaviest rain so far, getting as much as 5 to 6 inches (12 to 15 centimeters) of rain in some spots, Koch said. Strong winds are also expected, and may reach up to 60 mph (97 kph), he said. "There's a very high likelihood of damaging winds," he said. A wind gust of 61 mph was recorded at Dulles International Airport, according to the Weather Channel. The system could also spawn dangerous tornadoes. Tornado watches are in place in areas from the Carolinas to New York, he said. The system was produced in part by an unusual configuration of the jet stream, which has formed a dip or trough across the middle of the country, allowing Gulf of Mexico moisture to ferry up the East Coast "like a conveyor belt," Koch said. The evidence of all that moisture are the clouds seen blanketing the eastern half of the country in the GOES image. The system is also characterized by strong surface winds, with even stronger winds at higher altitudes. This arrangement is known to produce tornadoes, he said. Luckily the system isn't likely to stay around long, however. Koch said an approaching cold front in the Ohio Valley is likely to push it off the East Coast by tomorrow morning. This story was provided by OurAmazingPlanet, sister site to SPACE.com. Reach Douglas Main at dmain@techmedianetwork.com. Follow him on Twitter @Douglas_Main. Follow OurAmazingPlanet on Twitter @OAPlanet. We're also on Facebook and Google+.